Wiesehöfer, Josef & Sabine Müller (eds.). 2017. Parthika. Greek and Roman authors’ views of the Arsacid Empire (Classica et Orientalia 15). Wiesbaden: Harrassowitz Verlag. Established in the third century BC, the multi-cultural and multi-lingual Arsacid Empire became Rome’s major opponent in the East from the first century BC to its end in the third century AD. According to a Roman idea, the orbis was evenly divided between the Parthians and the Romans. However, in the Arsacid Empire oral tradition prevailed and, for a long time, there was no Arsacid historiography concerning perception, reception and interpretation. 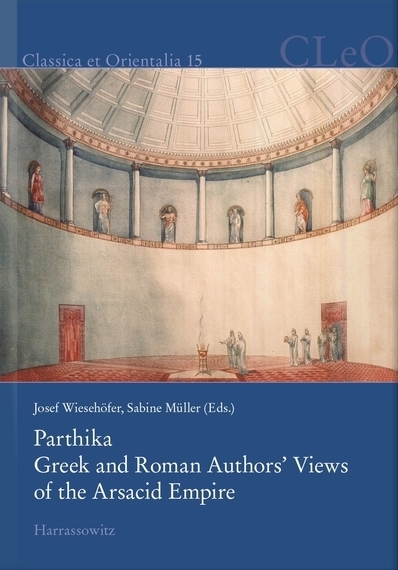 Therefore, Greco-Roman views and images of the Parthians, Arsacids and their Empire predominated. Focusing on literary depictions in ancient Greek and Roman literature and examining stereotypes, this volume brings together twelve papers on Greco-Roman perceptions and images of the Arsacid Empire. Part I consists of eight papers primarily concerned with re-assessments of Apollodorus of Artemita and Isidorus of Charax regarding their value as source of information on the Arsacid Empire. Part II contains four papers dealing with the images of the Arsacid Empire in the works of Josephus, Trogus-Justin, Tacitus and Arrian, viewed against their respective socio-political and cultural background.